Gracie Rose loves her quiet house. She is a very good dog, except for the day the noisy painters came. When she barks at them for causing a racket, she gets put outside. She decides to go for a walk; but then the painters, the neighbours and even the garbage man start to run after her! Poor Gracie does not know why everybody is trying to catch her, so she just keeps running. Soon everybody in the town joins in the chase. It’s the great Gracie chase! This book has a very clear sequence of events, so it is a good choice for working on a child’s sequencing skills in a narrative retell. It also includes lots and lots of verbs, including action verbs and mental verbs. Mental verbs (such as like, think, decide) can often be tricky to teach, but they are an important component in narratives to communicate the character’s internal responses. 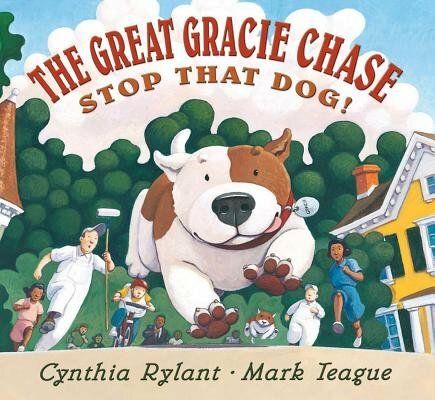 The Great Gracie Chase allows for plenty of opportunities to discuss the main character’s feelings and perspectives, and how these went on to influence her actions in the story.